We are always on the look out for new and local butchers shops on our journeys. 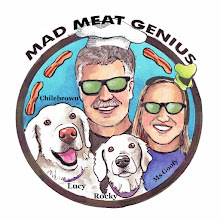 It is what this Mad Meat Genius loves to do and share with you readers. I rely on word of mouth, referrals, publications and one of my easiest tools; Google. Ranchers Meats and Deli is a Google find. 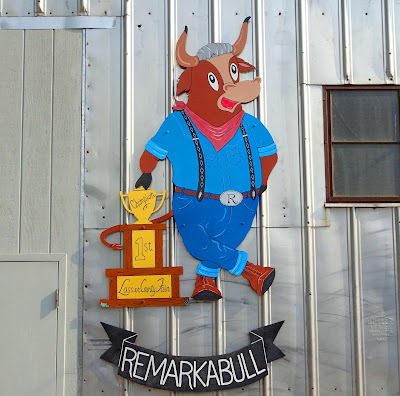 I was traveling to Redding California to visit my In-laws and Ranchers was on the way. It was a short detour off the main interstate 5 in Corning California. We do not know a lot about Ranchers Meats and Deli except this blurb from their website. "Deli Sandwiches/Wraps/Salads with a great selection of assorted Breads, Meats, Cheeses and Condiments. All sandwiches are made to order. We offer, BBQ sauces, Olives and Fresh Bread. 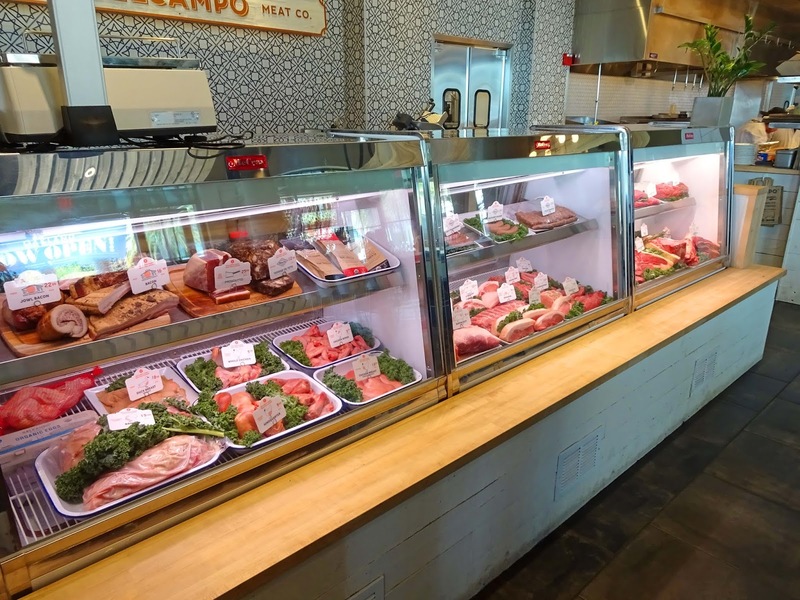 We are a Full Service Butcher Shop…Cut to order while you wait. We have the largest Marinated Meat section in town. 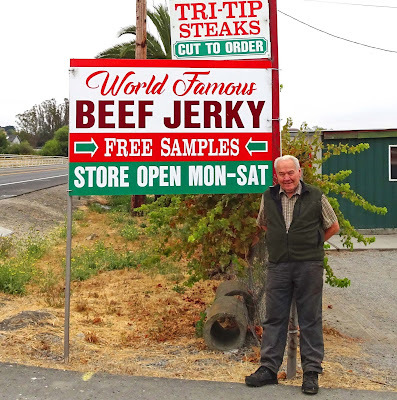 We welcome custom orders anytime small or large.We carry Buffalo, Venison, Beef, Pork, Chicken etc"
I entered the shop and did not really see all this. In fact the meat cases were pretty barren. I did see some sandwich making material but there was just not a big selection. There was a freezer case that did have some nice cuts of beef but the clerk did not know anything about them. I found this bone-in rib-eye roast and it was priced reasonably. I wanted to give this roast a home and it went into my empty cart. Not all of our Google referrals pan out with great results. We cooked this roast and enjoyed its beefy goodness. Did it rock our beef craving world? Let's just say it was a very nice dinner that was not worth writing home about. The Meat Adventure continues. 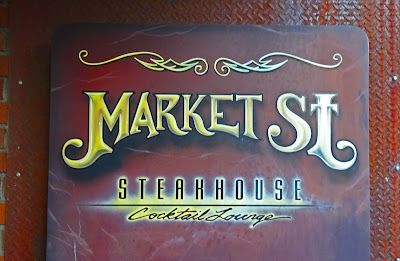 Welcome to Redding California we're going to visit Market St. Steakhouse. It will be nice to step out of the 110 degree heat and smoky skies to enjoy a nice dinner. Redding experienced a devastating fire several weeks ago and only today the fire is finally in the last stages of containment. My In-laws had several very tense days when the fire got way to close for comfort. 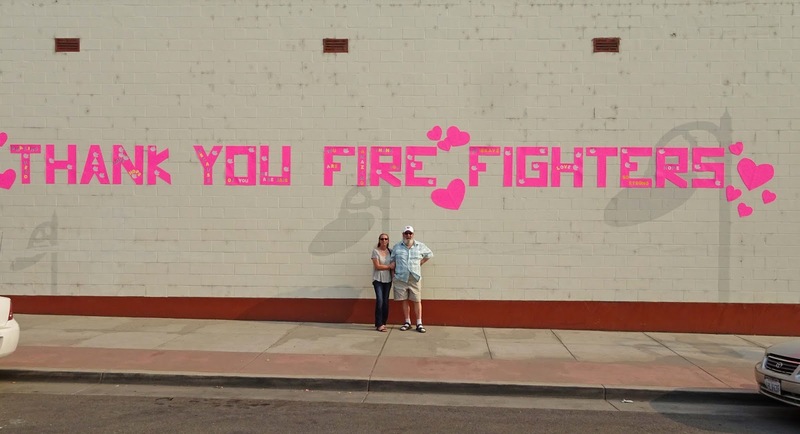 Throughout the town are signs thanking the firefighters. We are hungry and it is time for diner. 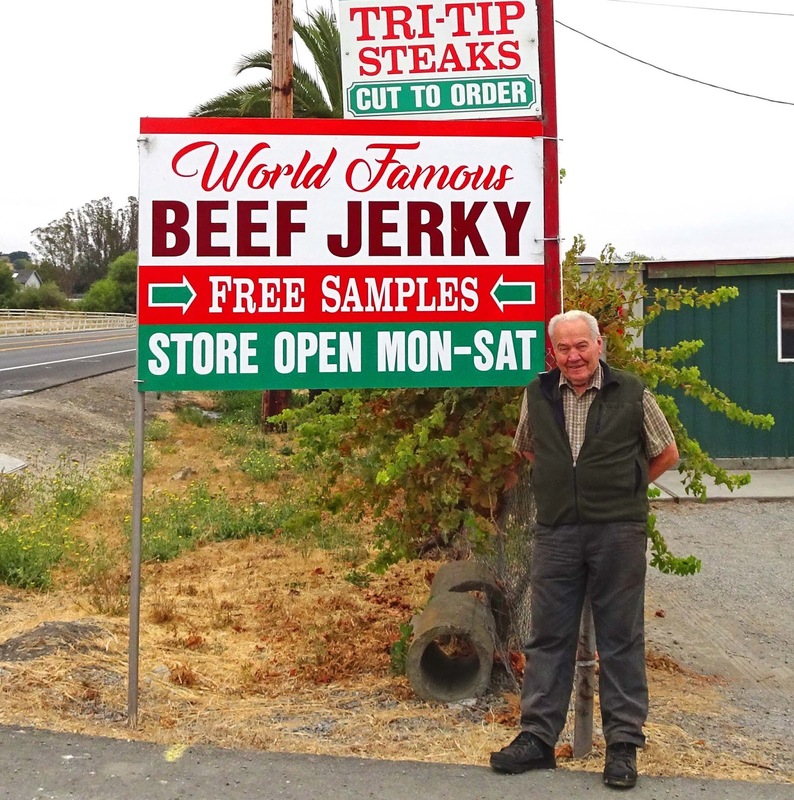 Redding California is not known for fine dinning and Market St has a reputation of being the best steakhouse in town. We walk through the doors to a dimly lit welcoming air conditioned establishment. 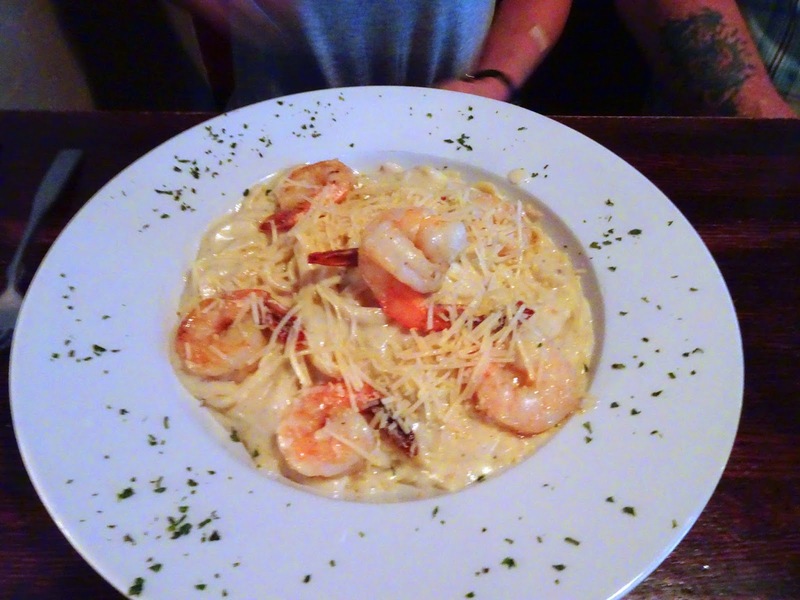 It takes several seconds for our eyes to adjust to our dinner destination. Our host is friendly. This is a recurring theme through out the dinner. Everybody is extraordinarly nice and always willing to make sure our dinning experience was perfect. 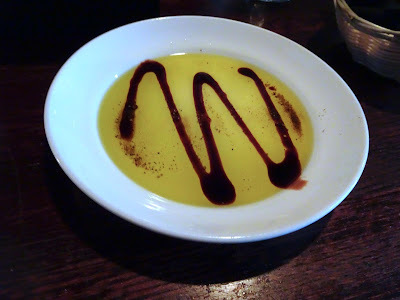 We ordered dinner and some complimentary bread and a fancy oil/vinegar combination accompanied. The oil and vinegar was a nice touch to some not so fresh bread. 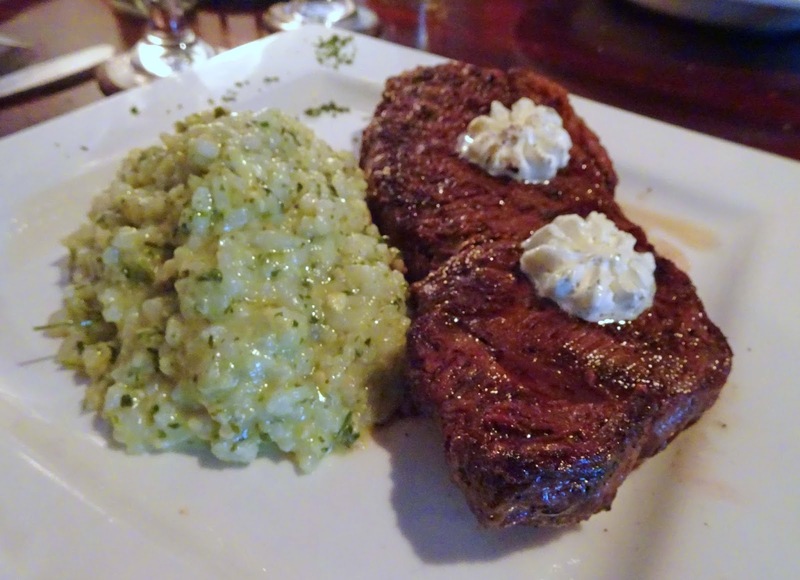 The steak selections were USDA Choice grade that is perfectly acceptable and I am sure tasted fine. 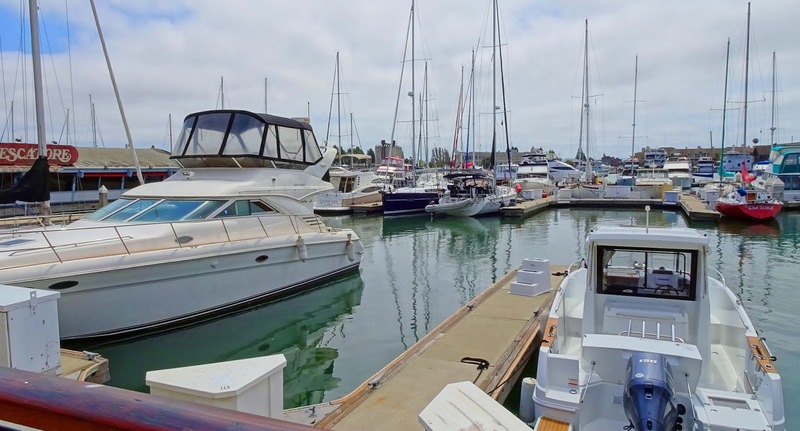 They also were priced at Bay Area premium rates and when I go out to a steakhouse I expect prime for my dollar. They did offer several steaks labeled as 'Prime" and called them "Wagyu Prime Cuts". This raised a red flag in my mind because true 'Wagyu" steaks are not rated by USDA standards and the term 'Prime" would not be used to grade a steak. I asked our waitress the origin and if she could tell us anymore about these Wagyu. She needed to ask somebody. She returned and said her manager did not know either but they called the meat distributor. 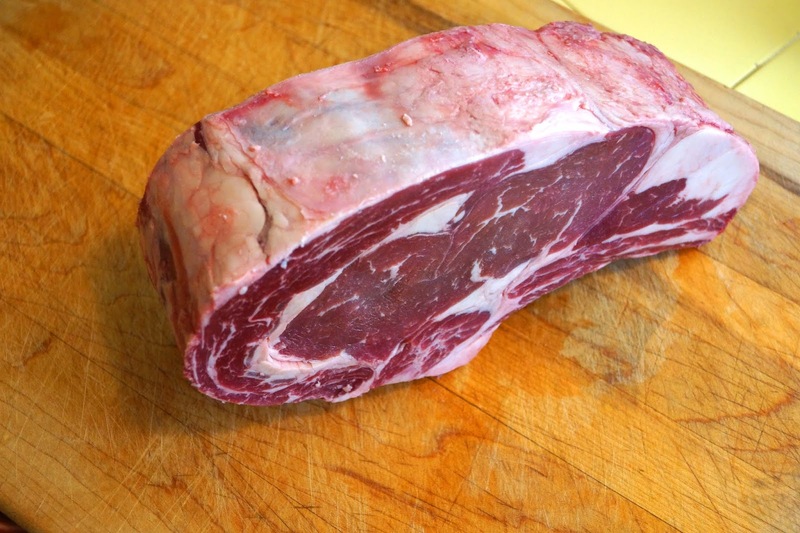 They were sourced from a ranch in Colorado and were considered American Wagyu crosses. I ordered a 12 ounce fifty four dollar New York Strip steak. My dinner included several choices of sides and I chose pesto rissoto and a salad. My sister in-law had shrimp linguini and my bro-in-law lobster. We were living large tonight. My In-laws loved both of their dinner choices. My steak was topped with two dollops of melting butter. This reinforced the buttery flavor of my steak. It was fantastic. This so called Prime steak was tender and the actual beef had a Umami type flavor that has a buttery like nuanced essense that makes you crave your next bite. My side of rissoto was cold. My server immediately went back to the kitchen and returned with a piping hot side of pesto rissoto. The rissoto was filling but did not have any elements that rocked my world. I want to mention the service again. 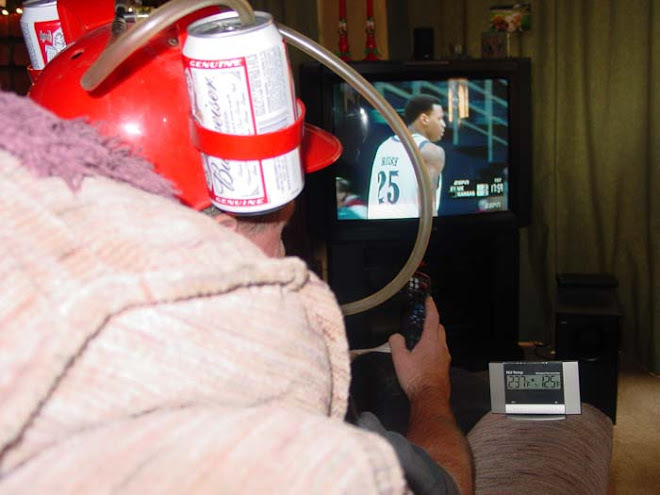 The service was top notch. The great service overshadowed the several dinning flaws of our dinner. (bread, rissoto). 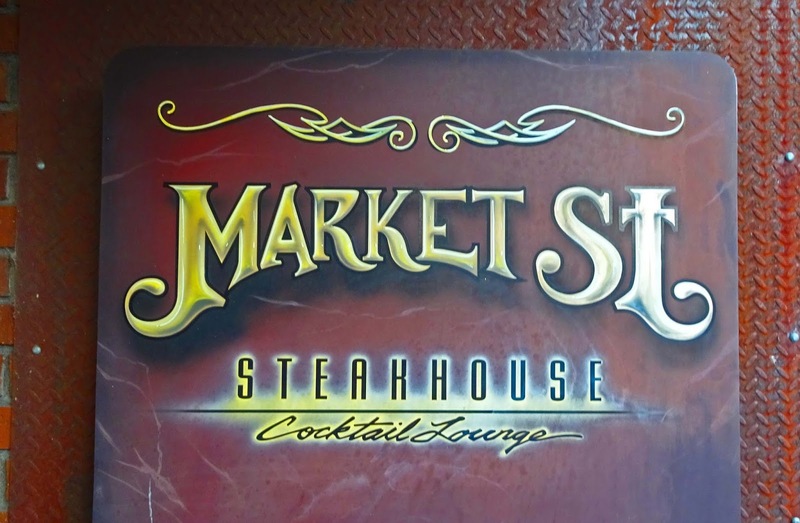 Market St Steakhouse might be the best steakhouse in town. We enjoyed our dinner. 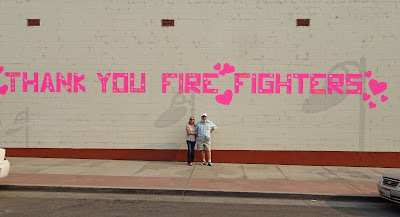 In closing we would like to extend a shout out to all the firefighters and first responders. Thank You! The gesture of the firm hand shake is dead, unless your friends with Angelo Iblieto. The firm handshake is a custom my Grandfather and my Father passed on to me. It was a sign of respect, friendship and possibly a badge of manhood. When you are friends with Angelo you will learn quickly that you must be prepared for a firm handshake that could be compared to a vice gripping contest of ‘mano y mano’ that may result in your crumpling to the ground in agony and hand pain. Now Anglo is in his young 80’s with catcher mitt hands with the energy and strength of any Olympic weightlifter. The secret to a firm handshake is to get a good grip, to not allow any advantage in the initial squeeze. Once you have equal grasps you squeeze with all your might, go along for the ride and hope for the best. I was prepared to shake Angelo’s hand today. He came at me with a twinkle in his eye. We extended hands and locked eyes and then went for the grip. The initial grasp was going well. We both were firmly grasping with torque and tension. I have to admit I was at maximum hand strength hoping this was going to be over very soon. Angelo smiled and with not saying a word gave my hand a wringing that humbled this man to submission. Angelo through brute hand strength once again showed me who the boss is. Angelo is my friend and King of the firm handshake. 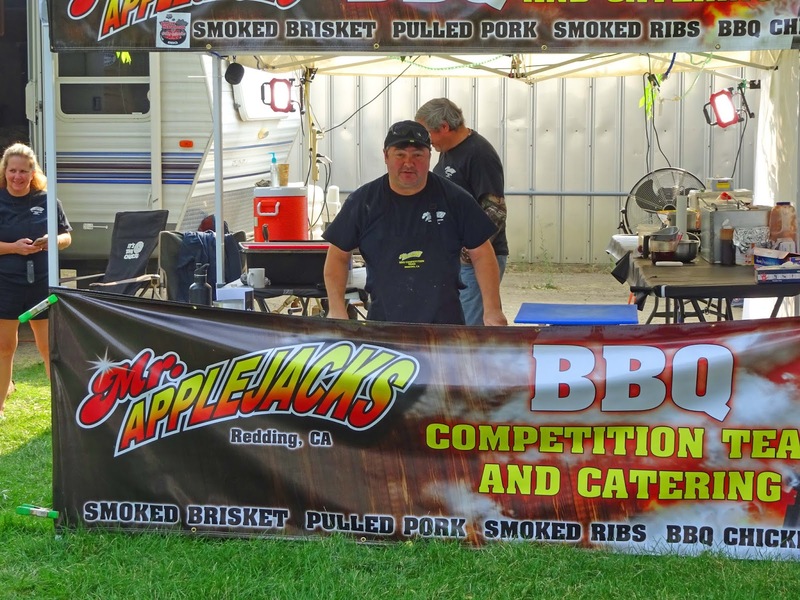 We are in Susanville California for the 4th Annual Lassen County Barbecue Cookoff. 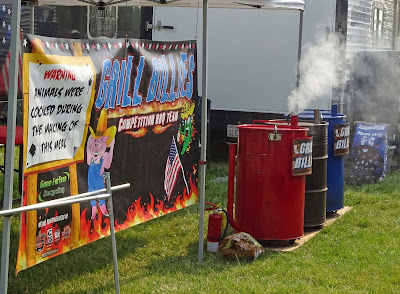 This was the 4th year but our second as attending KCBS judges to this big event at a small town venue. We were excited because the promoters promised this year would be bigger and better than the previous year. It was!!!! We would love to share a few pictures with you. 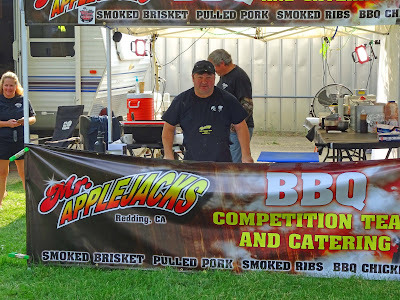 Twentyseven competitive barbeque team, showed up for this KCBS sanctioned contest. They were hunkered down is a shady grove of the Lassen County fairgrounds. This venue is the perfect place to hold an event. It has an old time feel that delivers a nostalgic fun atmosphere. There is plenty of shade to enjoy the bbq. We judges were sequestered in an air conditioned building that was perfect in the high 80 degree weather. There was a car show that highlighted a lot of pride and polished chrome. I particularly liked this model because my parents owned a similar car but I can guarantee it never looked like this. After strolling the car show one could go into one of the fair buildings to browse local craftsmen wares for sale. California has been covered with many wildfires this summer season. People are very supportive of all fire personal and responders. This helicopter landed very close to the bbq competitors creating a temporary wind storm. Despite this small inconvenience everyone was happy and proud to welcome this representation. 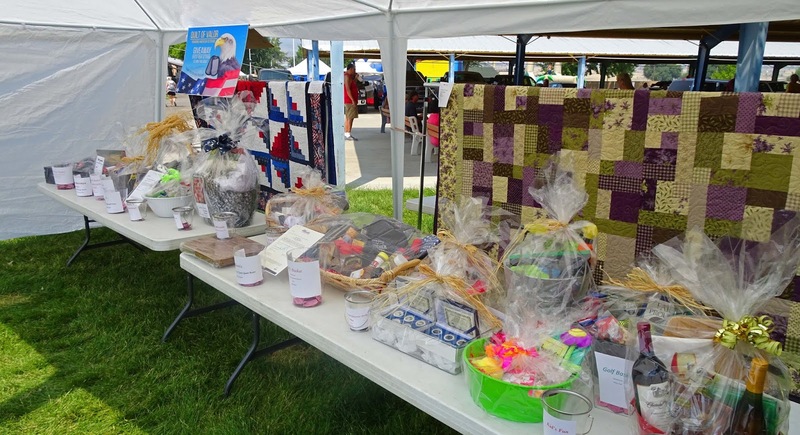 This was an event to benefit the Lassen Senior Services. This organization is very active in this community delivering meals to seniors. A raffle table was set up and tickets were sold. All proceeds benefited this important organization. I did not win the bbq but I am glad my money went to this cause. 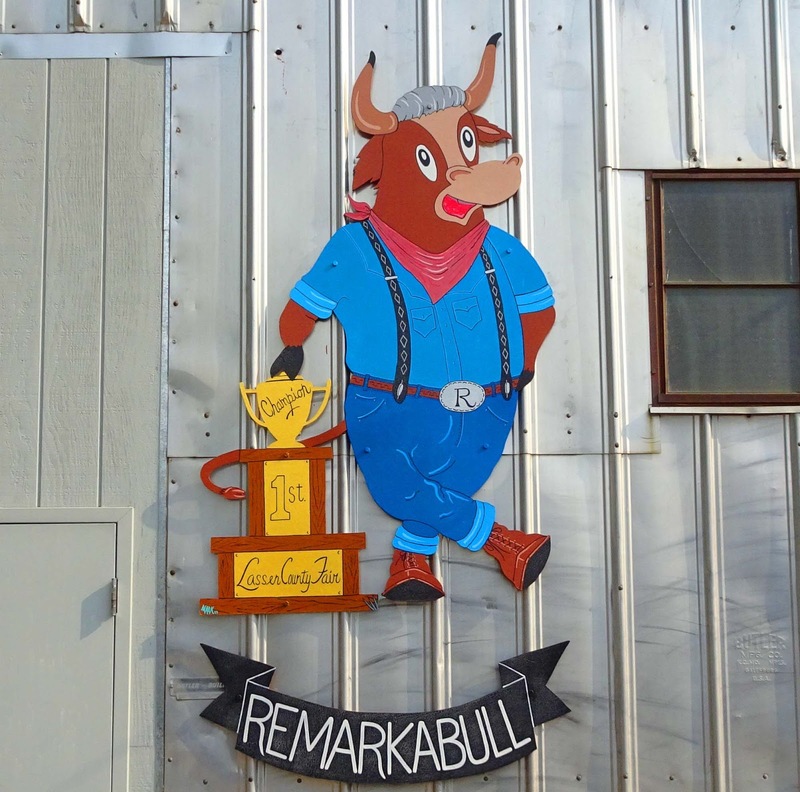 Congratulations to ‘Bull Market BBQ’ for winning the Grand Championship. This was a spectacular event and we cannot wait till next year. 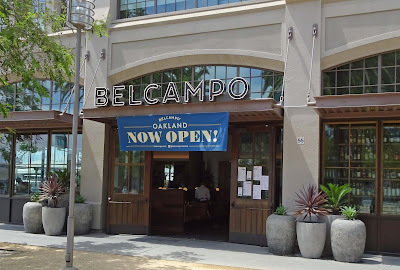 Several weeks ago was the Grand Opening of Belcampo Restaurant and Butcher Shop in the scenic Jack London Square of Oakland California. We wanted to wait a couple of weeks to bypass the opening jitters to go try the thirty two dollar, 100 day dry aged, grass fed, beef burger. To you who have not heard of Belcampo they are a successful ‘farm to table’ meat company. 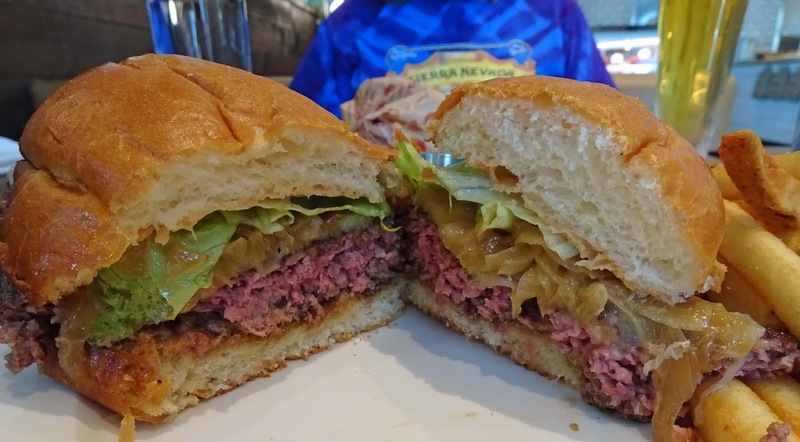 They are not only selling you quality grass fed beef but a concept with C.E.O Anya Fernald words; “Our vision is bold; our ambition is to build an alternative meat supply system; real solutions are never simple fixes. Help us put health, taste and transparency first. 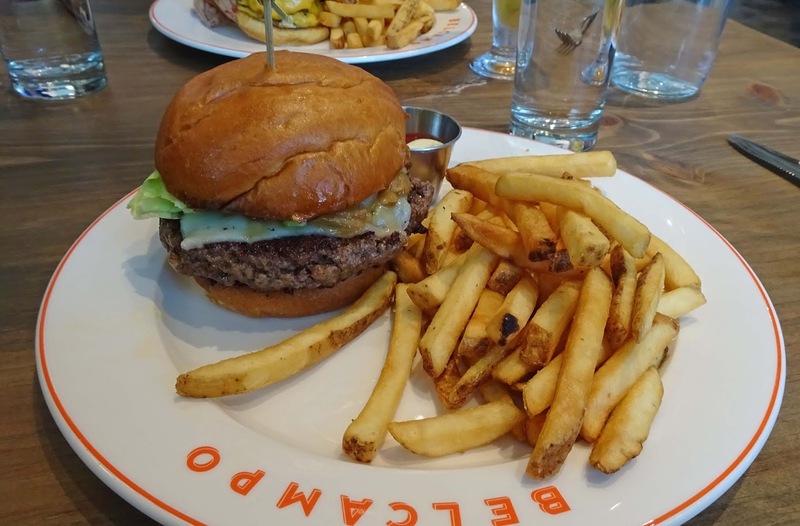 Help us build a better cleaner world through meat.” She also has been quoted in the New Yorker; “We’re creating a product that is financially non-viable for a lot of people.” We are here to try the hamburger. 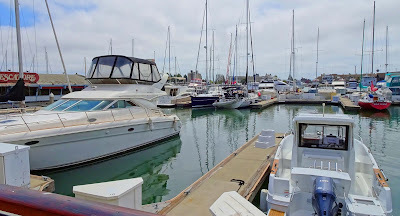 This is Jack London Square, so you park in the main parking garage. (Belcampo does not validate). We enter Belcampo to a bright, clean, modern and nice looking restaurant. We can see a small butcher shop in the back and a big bar on the right. This is a modern, urban setting with plenty of man-buns, skinny jeans, beards and hip looking servers and customers. We are seated immediately by the hostess and get menus. I do not see the 100 day aged burger on the menu. My server informs me they are out. We choose to order the 18 dollar 29 dry aged burger and another 12 dollar regular burger. Our server asked us if we wanted fries deep fried in beef tallow fat for an additional three dollars. We ordered both to compare. Our burgers were cooked and delivered promptly. I ordered my burger medium but the image proves otherwise. It did have good beef flavor. I enjoyed it. This burger had caramelized onions as a topping which added a sweet component that was very desirable. I thought the aging process added a mellowness to the beef I can say that after tasting Ms. Goofy’s burger which had a sharpness and almost a gamy type of flavor. This should have been expected with this grass fed offering. We both enjoyed our burgers. Both of our plates had a generous helping of fries. Ms. Goofy was supposed to have the beef tallow fried batch. We tried each other’s fries. We both scratched our head because they both tasted the same. Our server came by to check on us and asked us which fry we liked better? Apparently we had both got the regular fries and our server said she would bring us a batch of the tallow fries immediately. They arrived immediately after we had almost finished our burgers. They were limp and not even salted. Oh my! Well, so much for our three dollar upgrade. I am not sure we will return to try the 100 day dry aged burger. We enjoyed our burgers, not the fries. Belcampo Oakland is a clean modern restaurant that is selling not only quality grass fed beef but a new modern concept in the beef industry. This Mad Meat Genius has just not yet jumped on the band wagon. I love fried sugary treats. 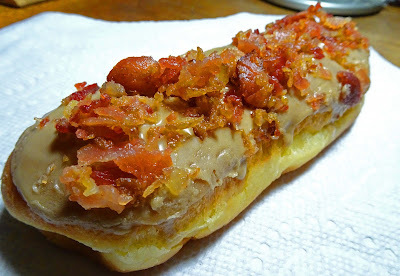 Add some bacon and it is a done deal. Alhambra Donut and Deli has bacon maple bars that I could not resist. I am surprised that California has not declared these decadent delights as illegal. Until they do I will eat my fill. 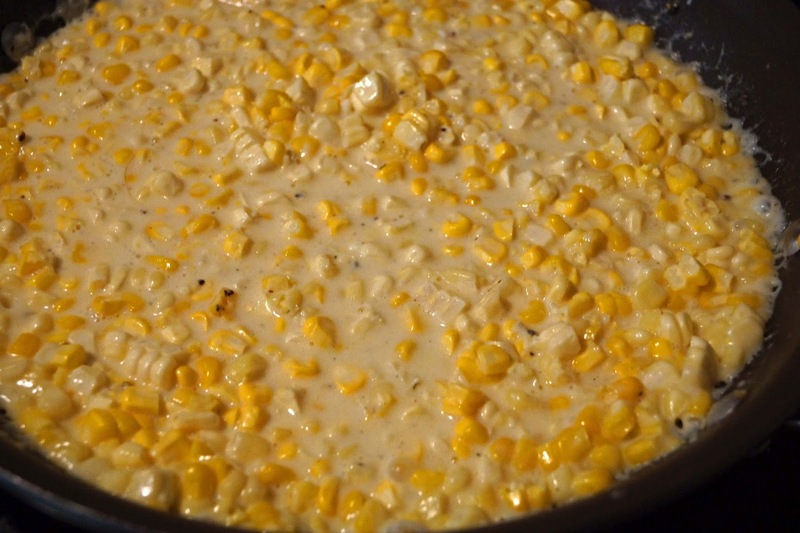 Creamed corn, so simple but so satisfying. 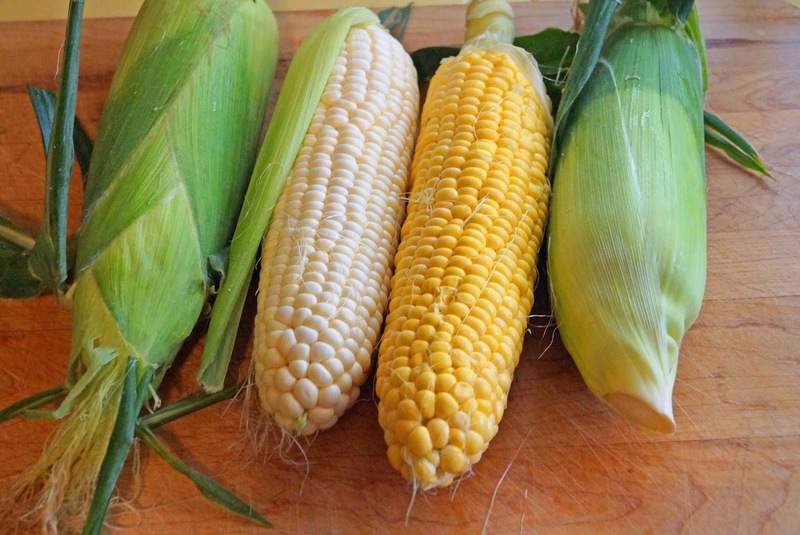 Sweet corn on the cob is in peak season right now. All the farmers markets, stores and sometimes even my backyard has fresh corn available. I had forgotten how easy this dish is to make We picked up several ears of corn at our local farmers market and decided to make some creamed corn. Four tablespoons of butter, 1 cup of milk, 1 tablespoon of flour, salt & pepper and 4 ears of corn (We used 2 yellow and 2 white) are all the ingredients needed. Cut the kernels from the ears of corn and reserve in a bowl. Take a spoon and scrape the cob to get all the remaining corn starch Whisk the flour into the milk. Melt the butter into a saute pan over medium heat. 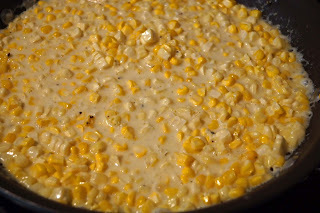 Add the corn and briefly stir. Add the milk and bring to simmer. Add the salt & pepper to taste. Cook for around 5 minutes or until mixture is thick and creamy. I like the corn to still have a little bite. Now wasn't that easy. 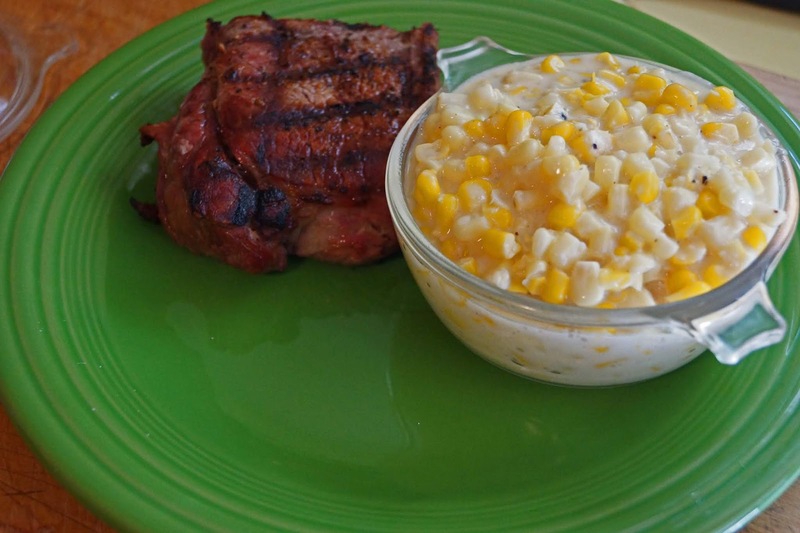 We served our creamed corn with some barbequed steak. This dish is so satisfying. A lot of recipes call for a little sugar to be added to this dish. Our corn was so fresh this was not needed. Sometimes simple is so much better.